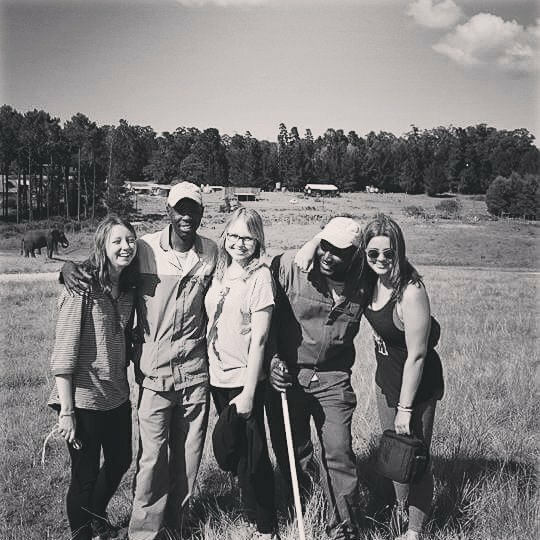 Robyn recently returned from three weeks as an elephant volunteer in South Africa. Last week she shared how she felt in the run up to her trip and today she is sharing her experience on the programme. On the first day, the new volunteers were shown around the park, and made to feel welcome. We also met the elephants; I remember being completely mesmerised by them. They were just so…large. Yet so quiet on their feet, gentle and above all, lovely. By the end of my stay, I was surprised to find that I could identify an elephant just by a quick far away glance. They became as recognisable as people to me. Their personalities were all so distinct that I could probably have just identified them from their behaviour alone. Needless to say, I was completely in love with the herd by the time my stay came to an end. We also met the elephant guides, who are some of the most interesting people I’ve ever met. The guides love the elephants dearly and know everything there is to know about them. 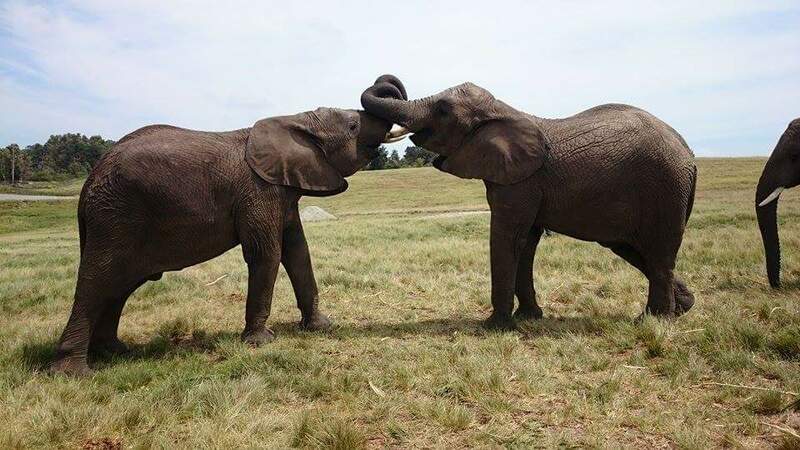 It was so interesting to see how the elephants interacted with them as well – you can really see what intelligent animals they are. The volunteering really took off in the second week – I no longer felt twinges of homesickness, and I was fully trained up. I began to love the hard work, despite the early starts and the healthy amount of elephant poo and mud that would end up on my clothes at the end of the day. It was so refreshing to get stuck in, and to truly immerse myself in the work of the elephant research unit. While out on the field collecting data on the elephants behaviour, I got to know and love the Guides and the elephants. During my time in the field, I had an elephant steal my water bottle, I was sprayed with mud (on more then one occasion), I watched the elephants play in the dam, made friends (not just with the people, I may add) and rode in a tractor full of branches in amongst a herd of baby elephants. I also got the opportunity to ride on an elephant. It was tricky for me to know how to feel about riding on an elephant- it was a once in a lifetime experience. When was I going to get this chance again? But at the same time did I agree with it? Was it fair on the elephants? In the end, I had to come to the conclusion that it was. It was made pretty clear to me how an African elephant quite simply, doesn’t do anything it doesn’t want to do. The guides always make sure that the elephants are okay before they do the rides, and if one of them doesn’t feel like it, then they don’t. I was delighted to see over the weeks how the elephants welfare was the first priority of the park. The knowledge that you are contributing to ensuring their welfare is also a pretty amazing feeling. I seem to have come back from the experience with a mind much more knowledgeable about animal welfare as a whole. The last week of volunteering brought my first early boma observation. These shifts start at 5.00 AM and this may instantly put people off the idea, but it shouldn’t. It turned out to be a very special experience for me. It’s just you, observing the elephants first thing in the morning, with the sunrise and the morning silence. I will look back on the whole of that last week with fondness; My roommate and I were now close friends, and we would cook and eat together in the evenings. I also walked out with a herd of elephants at 7AM in the morning, watching them roam and interact. I also made the most of being with the elephants and now knowing them so well. On one day, we travelled to the forest where the elephants originated. It was such a fascinating experience. The forest itself was beautiful; there were trees everywhere, with trickling streams, unusual plants and birds, and the forest itself had a mysterious atmosphere to it. Some believe there are a few elephants left that still roam the forest, but others think they are all gone from the days where they were killed for tusks and convenience when mining for gold (you can still see the mines they dug). At the end of the hike, we found a waterfall and lagoon which we decided to swim in. Hands down, an incredible experience. We also swam with wild seals that weekend at the Plettenburg Bay beach. There were over 6000 seals populating the rocks and the sea, everywhere you looked. I’d never seen so much wildlife! And probably the greatest experience of all, the day before I left, going Skydiving. I don’t even have the words to describe the amazing feeling it gave me. I can only write about my own experiences at the elephant park, to give someone a vague idea of what it will be like. I think it’s probably a very different, personal experience for everyone, and such an important one. You should do this project because it doesn’t just give you incredible stories to tell, but it makes you learn things about yourself, which in itself is completely invaluable. If you are thinking about doing this project, my advice would be to book it now! I guarantee you’ll have an amazing experience. I came away from the elephant park with more confidence, new friends, and a different outlook on the world. Oh, and it also gave me a huge case of the Travel Bug… plans for my next trip are underway!